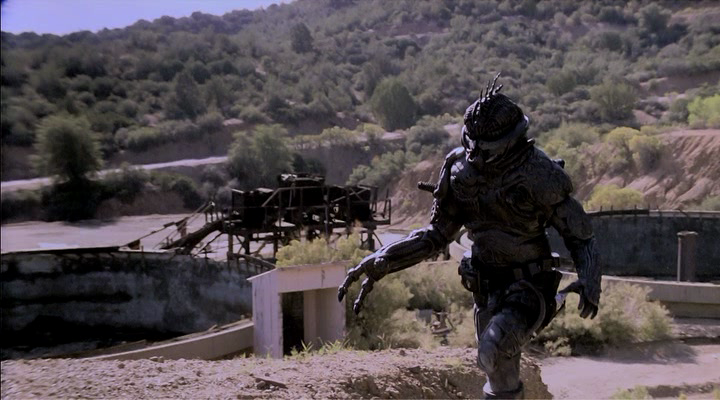 The original Nemesis (1992) was a good example of how to make a dystopian science-fiction action romp. It transcended its budgetary limitations thanks to an intelligent screenplay that left plenty to explore in potential sequels. It also proved quite lucrative in the home video market. Nemesis (1992) had style to spare and its action was explosive and elegant enough that it had some minor Hong Kong aspirations. Olivier Gruner couldn’t act if his life depended on it but he was surrounded by an ensemble of players that (for the most part) have gone to have respectable careers in Hollywood. What sold Nemesis (1992) is that it combined John Woo bullet ballet action sequences (complete with trenchcoats, sunglasses and short-skirted babes branding big guns) with faux-philosophical wanderings about the human condition and what it means to be human. It was equal parts Blade Runner (1982), RoboCop (1987) with a nigh on indestructable enemy modeled liberally after The Terminator (1984). In short, it was everything (and more) you’d want out of a science-fiction/action romp. There was tons of promise and potential for a franchise after its initial manifesting. Unfortunately nothing is ever as straightforward and Nemesis 2: Nebula is a first such exhibit. Before long Hawaiian director Albert Pyun found himself back at the drawingboard to start pre-production on a possible follow-up. One of the primary aspects that was responsible for lifting Nemesis (1992) out of the dregs of the low-budget action morass was an articulate screenplay written by Rebecca Charles and an uncredited David S. Goyer. Neither had any interest in returning for the sequel and neither had Parisian kickboxer Olivier Gruner that matter. In fact nobody from the original returned. Those hoping to see Tim Thomerson, Thom Mathews, or Brion James as primary antagonists will be sorely disappointed and equally absent are Borovnisa Blervaque, Marjorie Monaghan, and Merle Kennedy. This where things get murky and it’s not clear what led to the materializing of the feature that would eventually become Nemesis 2: Nebula. What is clear is that in 1995 Pyun helmed a feature starring Sue Price and Chad Stahelski in the barren deserts of Globe, Arizona. The shooting was fertile and the finished feature was over three hours long. It’s unclear whether it was Pyun or his producers who vetoed that the excess footage of the shoot was to be used to edit together a third feature along with newly shot footage from additional production days. Whereas Nemesis (1992) was a budget-efficient derivative of James Cameron’s infinitely superior The Terminator (1984), Nemesis 2: Nebula blatantly apes John McTiernan’s Predator (1987) and George P. Cosmatos’ Rambo (1985) instead. Replacing the absent Olivier Gruner is award-winning bodybuilder Sue Price who landed the part Kristie Phillips and Kathy Long auditioned for. Stuntman Chad Stahelski is the titular Nebula, a cybernetic infiltration unit decked out with light-bending camouflage, a mounted shoulder-cannon, and various surveillance options (radar, infra-red, audio, voice analytics, et al) in its HUD. Nebula also happens to look like a cross between Predator (1987), David Cronenberg’s iteration of The Fly (1986) and one of the rubber-suited monsters from Infra Man (1975). The other well-known face in the cast is Tina Cote who went from an extra in Francis Ford Coppola’s opulent Bram Stoker’s Dracula (1992) to the wacky world of Albert Pyun in just a few years. 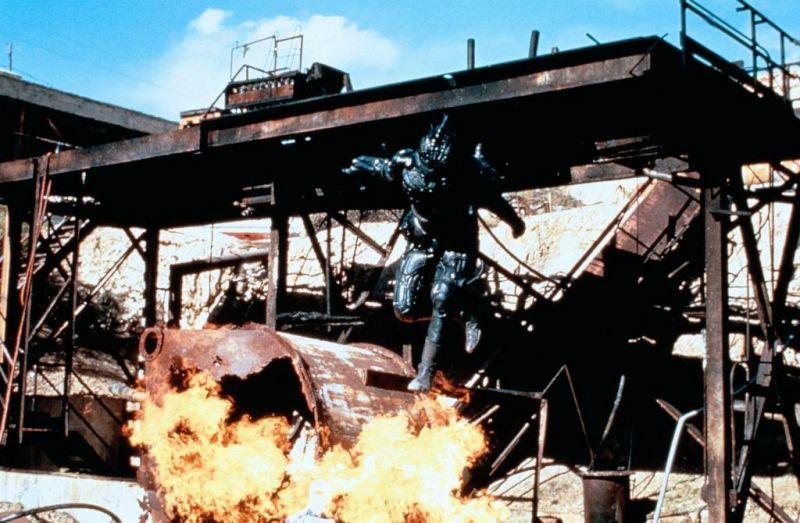 For reasons largely unexplained director Pyun has decided to abandon the dystopian cyberpunk setting of the original Nemesis and along with it much its over-the-top Hong Kong heroic bloodshed inspired cinematography, gunplay, and stuntwork. Depending on the scene Nemesis 2: Nebula either tends to look like as a gender-swapped Rambo (1985) or a post-apocalyptic desert flick from Cirio H. Santiago. In fact this would have worked better as a feminine variant on Rambo than anything else. 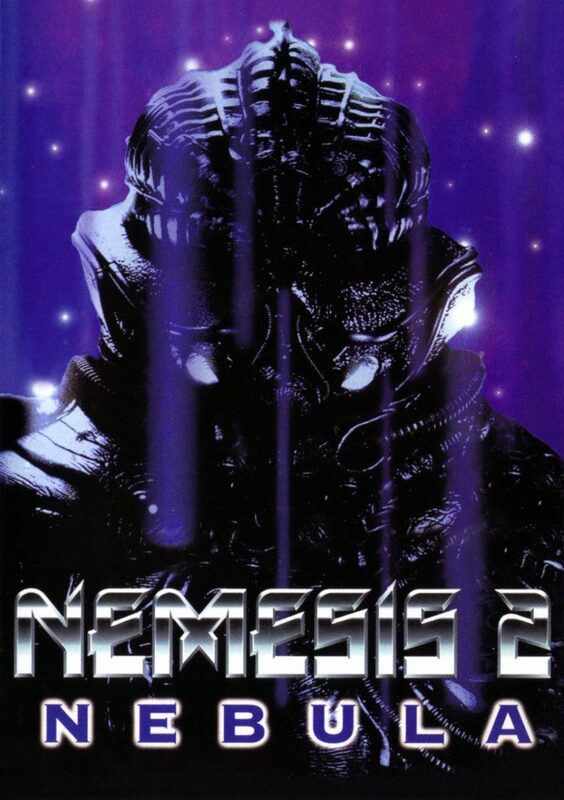 Nemesis 2: Nebula looks as if it was it was a stand-alone production with the Nemesis mythology forcibly shoehorned in to make the most of what little budget was around. Suffice to say, Nemesis 2: Nebula barely has any connection to the 1992 original. It marked the start of a strange journey that would continue with the futile Nemesis 3: Time Lapse (1996) (or Prey Harder, depending on the territory) and take a turn for the bizarre with the staggeringly incompetent Nemesis 4: Cry Of Angels (1996). 2077. Humanity has been enslaved by the cyborgs. 73 years have passed since Alex Rain valiantly tried to topple the cyborg uprising… and failed. Scientists have developed a new strain of DNA, injected it into a baby girl (Zachary Studer) and a volunteer surrogate mother Zana (Karen Studer) has agreed to carry her to term. When the cyborgs find out about Zana and the DNA baby they send out platinum blonde twin mercenaries Lock (Sharon Bruneau) and Ditko (Debbie Muggli) to ensure that mother and daughter are both destroyed. Zana is able to transport the baby back to 1980 East Africa before being killed. A local tribe accepts the orphaned baby as one of their own and in the year 2000, some twenty years, later Alex Raine (Sue Price) has become a formidable, musclebound warrior. Having at long last found Alex’ present whereabouts the cyborgs dispatch a highly-advanced bounty hunter called Nebula (Chad Stahelski) to dispose of the genetically-engineered Raine who’s prophesied to bring down the cyborg regime. Amidst the chaos of her various confrontations with Nebula in the desert Alex runs into shady treasure hunters Emily (Tina Cote) and Sam (Tracy Davis) who have chartered a small plane and hide mysterious golden coins. Will Raine be strong enough to defeat Nebula with only these primitive weapons at her disposal? What Nemesis 2: Nebula makes painfully clear is that Albert Pyun is a terrible screenwriter. Had this remained the stand-alone feature it was probably intended as things would be a whole lot different. As far as Predator (1987) and Rambo (1985) derivatives go, this one is at least halfway entertaining. However as a Nemesis (1992) follow-up there’s no reason to be quite so charitable and forgiving. Even as a in-name only sequel Nemesis 2: Nebula only has the flimsiest of connections to the original and it makes the cardinal mistake of inventing an entire new mythology that at no point resembles or echoes the spirit or aesthetic of its superior forebear. Pyun has the new Alex Raine engaged in a decisive confrontation with a highly-advanced adversary that never was so much as mentioned in the original. It also places Raine a good 4 years ahead of the timeline of Nemesis (1992) which raises all sorts of questions: if, theoretically speaking, Alex Raine defeated the cyborg threat in 2000 doesn’t that render her efforts futile as her genetic forefather Alex Rain was fighting the uprising in 2004 still? If Nebula and time-travel devices existed in the original timeline why then did the cyborgs not send Nebula after the original Alex Rain instead of an isolated, solitary infiltration unit (Farnsworth)? Pyun’s screenplay creates a whole set of new problems that Nemesis (1992) was free of because Rebecca Charles and David S. Goyer actually knew what they were doing. Nemesis 3: Time Lapse (1996) and Nemesis 4: Cry Of Angels (1996) in no shape or form ever helped forwarding the narrative. No. Only Dustin Ferguson’s belated sequel Nemesi5: the New Model (2018) would attempt that, but it did so by drawing all the wrong conclusions from the three Sue Price episodes. Under the circumstances Sue Price is the least of the production’s rather fundamental problems. Price acquits herself admirably in what in charitably can be described as a 90-minute chase scene. Pyun was wise enough to limit Price’s dialogues to be absolute required minimum to maintain a simulacrum of humanity. Price throws herself into the character in the way you’d expect of a professional athlete and fate has been somewhat retroactively cruel to her as her appearance in Nemesis 2: Nebula and Nemesis 3: Time Lapse (1996) at least should have made her a reliable supporting actress in low-budget action and science-fiction. Was Sue Price ever good enough an actress to headline her own feature? That’s debatable but Albert Pyun also worked with Robert Patrick shortly after his tenure in Filipino exploitation with Cirio H. Santiago. Patrick cut his teeth under Santiago and only became an action hopeful with a small supporting part in Die Hard 2 (1990) (where he had but a single line of dialogue) which led to him being cast in James Cameron’s Terminator 2: Judgment Day (1991). Price, on the other hand, never was given such an opportunity. Also upgraded in the company of stock players is Pyun muse Tina Cote who would become the director’s de facto leading lady from this point forward. As these things tend to go Cote never got her due either and she’s criminally underused in a plot that’s barely threadbare to begin with. Had this followed the dystopian cyberpunk setting of the original Tina Cote had made a decent replacement for Marjorie Monaghan. Why Borovnisa Blervaque never was cast in a Pyun production again is a question for the ages too as she was the best thing about Nemesis (1992) by far. That Nemesis 2: Nebula looks and feels completely different from Nemesis (1992) gives credence to the notion that it was originally conceived as a different stand-alone feature. The differences are staggering and everything that made Pyun’s surprise minor cyberpunk/action hit so brazen and inventive is sorely absent in the sequel. Nemesis 2: Nebula would probably have been a lot better had it been kept in its intended form. As a brute science fiction/action hybrid it’s worthwhile enough and can compete with many a post-nuke action flick from either Italy or the Philippines. However it’s beholden to a whole set of different expectations since it comes bearing the Nemesis (1992) name. Nemesis 2: Nebula has only the most threadbare of connections to the movie from whence it came and does nothing to forward the mythology. Sue Price shouldn’t bear the brunt of the blame for the fiasco this turned into. No. The blame should squarely be cast at the feet of writer/director Albert Pyun and his moneymen. At some point during production someone, either in the director’s chair or on the production end, should have realized that Nemesis 2: Nebula bore about zero connection with Nemesis (1992). Had this been turned into a stand-alone mini-franchise then Price could’ve probably built a modest career out of it. Nemesis 2: Nebula (and its ill-begotten sequels) damaged the careers of everybody involved. Somehow you’d expect more from a franchise name after the ancient Greek goddess of retribution.